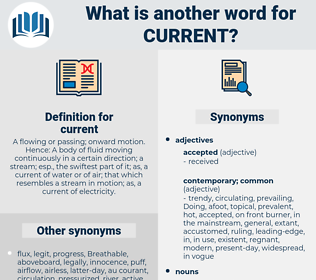 What is another word for current? present, existing, prevalent, existent, modern-day, current-account, frequent, recent, in-progress, concurrent, previous, then-current, mainstream, moment, normal, actual, conversant, urgent. present, presents, existing, outlines, contracts, parameters, lists, topics, hosts, offers, Persons, objects, releases, recent, actual. stands, present, existing, mainstream, moment. exists, operates, applies, stands, existing. antiquated, old, uncontemporary, past, uncommon, old-fashioned. fabulous, anachronistic, unconventional, exploded, olden, discarded, up, baseless, hoary, historical, coming, extraordinary, over, ago, false, exceptional, completed, done, concluded, historic, counterfeit, forgotten, ended, unusual, abnormal, timeless, unpopular, apocryphal, unborn, through, finished, bygone, remote, unmodernized, terminated, fusty, passe, spurious, venerable, old fashioned, ageless, unauthorized, musty, disputed, future, kaput, nonstandard, fictitious. The Prince pushed the boat into the river, and got into it, and the swift current seized him and hurried him away. Twenty kilowats of power will be used, enough to furnish current for about forty flatirons. chromate, craniata, caranday, coherent, churn out, chermidae, chromatid, craniate, crenated, case agreement, chironomidae, corn mayweed, cariamidae, carinate, carnot, cornet, cheese rind, coroneted, coronate, corn mint, crinoid, cremate, cairned, chromite, criminate, carinated, crannied, crinoidea, carnotite, charmed, co-occurrent, crenate, crowned head, coronet, crowned, corinth, creamy-white, cerement, caranda, currant, chagrined, car window, corned. tidal current, maelstrom, rip current, whirlpool, riptide, tidal flow, undertide, violent stream, eddy, torrent, twist, vortex, undercurrent, ocean current.